Ask a scientist about Hollywood, and you’ll probably get eye rolls. But ask someone in Hollywood about science, and they’ll see dollar signs: moviemakers know that science can be the source of great stories, with all the drama and action that blockbusters require. That’s a huge mistake, says Randy Olson: Hollywood has a lot to teach scientists about how to tell a story—and, ultimately, how to do science better. With Houston, We Have a Narrative, he lays out a stunningly simple method for turning the dull into the dramatic. Drawing on his unique background, which saw him leave his job as a working scientist to launch a career as a filmmaker, Olson first diagnoses the problem: When scientists tell us about their work, they pile one moment and one detail atop another moment and another detail—a stultifying procession of “and, and, and.” What we need instead is an understanding of the basic elements of story, the narrative structures that our brains are all but hardwired to look for—which Olson boils down, brilliantly, to “And, But, Therefore,” or ABT. At a stroke, the ABT approach introduces momentum (“And”), conflict (“But”), and resolution (“Therefore”)—the fundamental building blocks of story. As Olson has shown by leading countless workshops worldwide, when scientists’ eyes are opened to ABT, the effect is staggering: suddenly, they’re not just talking about their work—they’re telling stories about it. And audiences are captivated. 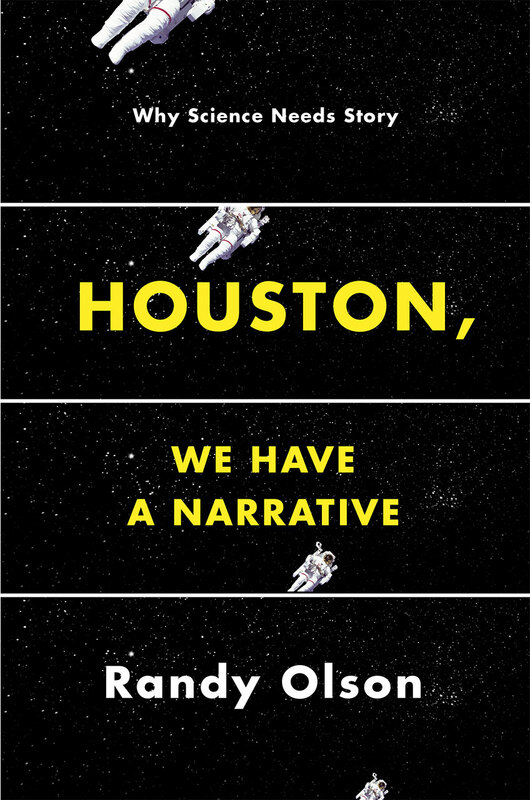 Written with an uncommon verve and enthusiasm, and built on principles that are applicable to fields far beyond science, Houston, We Have a Narrative has the power to transform the way science is understood and appreciated, and ultimately how it’s done. "If you've read the Dot Earth blog a lot, you know I'm a fan of the ultimate science-as-story coach, Randy Olson, who left a tenured job teaching marine biology to make provocative films on science controversies and then write, and write, and write about connecting science to society through storytelling. His new book, Houston, We Have a Narrative, is the ultimate distillation of his communication philosophy, which is to be relentlessly, even recklessly, creative (avoiding 'the nerd loop' at all costs) while hewing rigorously to a template that has roots in Aristotle and Hegel and runs through every South Park episode." "The ultimate science story coach." "Applying a screenwriting scientist's eye to everything from the Gettysburg Address to the discovery of DNA to global climate change, Olson shows how closely the principles of great narrative can match up with the scientific process. More important, he lays out in clear, specific steps what scientists can do to bridge the unnecessary but persistent gap between good science and good story. The results ought to be of enormous benefit to both science and the public." "Olson brings the mind of a scientist to the search for structure within narrative which he has now codified for the mass communicator. His new book on narrative provides simple, powerful templates that are widely applicable." "From Aristotle to South Park, Randy Olson has mined story-telling wisdom through the ages to develop this funny, helpful guide for scientists who want to meld minds with the rest of the human race. He shows why scientists need to tell stories, and then he shows them how to do it."